A new coworking space has opened its doors in Port Stephens designed to put the spark into business. Spark CoWork offers a place for people to come together and work in a positive and energetic environment. The concept of the space has been created to spark entrepreneurial and collaborative business ideas and opportunities. The space was the creation of Rebecca Morley and Naomi Farrelly, two consultants who had a desire to move out of their home offices into a flexible and welcoming space. Spark CoWork has been carefully incubated through the Business Connect program that has been facilitated through The Business Centre, Newcastle. Through the dedicated assistance, provision of business tools and high level of personalised support received through the program, their vision has finally become a reality. 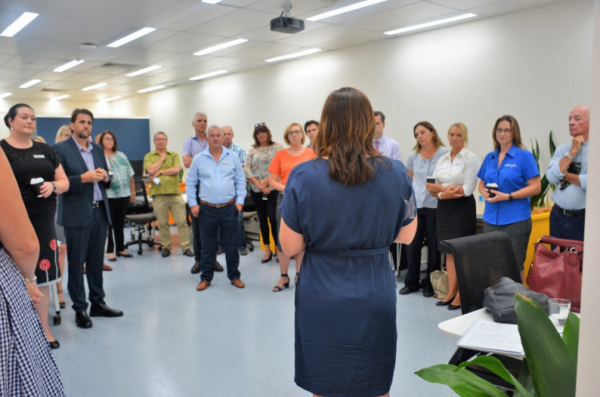 Spark CoWork is located in Salamandar Bay and offers flexible and affordable work spaces that cater to a variety of like-minded people from across the Port Stephens local government area. Rebecca said the vibe of the new space is friendly, professional and cool. “Coworking is more than just a space with desks and chairs. The best coworking spaces are inspiring destinations to work, connect, and collaborate,” Rebecca said. Spark will also now offer a business advisory service to local businesses. The service, facilitated by The Business Centre, will allow small businesses to have access and meet with a qualified Business Advisor every second Thursday in Spark’s coworking space. General Manager of The Business Centre, Steve Wait announced the official opening of the new service in March. “We are excited to announce that we will be providing a dedicated business advisor in the space every Thursday fortnight to facilitate the Business Connect program,” Steve said. Spark CoWork offers a mix of casual hot desks, permanent desks, collaborative workspaces and meeting rooms. It’s designed for people who currently work from home, micro businesses, entrepreneurs, startups and those needing a workspace whilst on holidays. “Spark CoWork will provide a unique space for businesses in Port Stephens, for our collaborative community to expand and grow, thereby building capacity, creating new jobs and ultimately stimulating the business ecosystem of the region,” Rebecca said. IMAGE | The official opening of Spark CoWork.